Farooq Rai, Richmond-based Canadian of Pakistani origin artist considers the inspirational message of Allama Iqbal (poet and philosopher b. 1877) as a means to preserve a unique cultural identity and heritage within British Columbia. 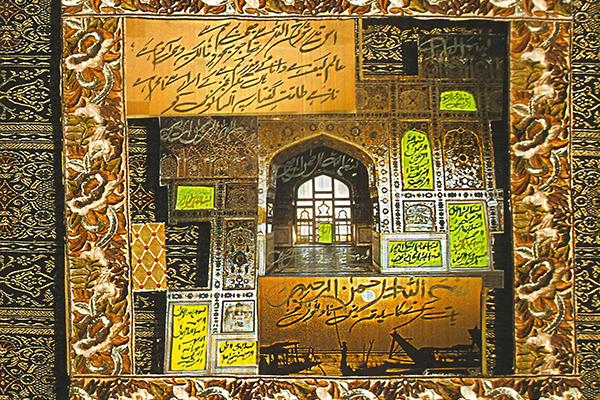 The exhibition presents a selection of Rai’s unique collage’s highlighting Arabic/Urdu calligraphy and a message of peace and harmony. Rai was appointed as the first Assistant Deputy Minister, and Head of Ministry responsible for Multiculturalism and Immigration in 1994. Also a writer and advocate in the community, Rai’s passion and sincere commitment to raising awareness of the Pakistani/Islamic literary cultural heritage is core to this body of work.